Ritner Creek Covered Bridge, built 1927. Built in 1927 at a cost of $6,964, Ritner Creek bridge is 75 feet long and uses a Howe truss. The bridge was built by Hamar and Curry. 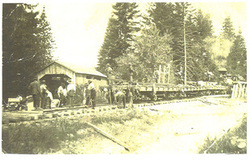 During Charles Otis Hamar’s lifetime, which spanned 1887-1962, he was builder or contractor for many Howe Truss structures like Ritner Creek’s that are still standing, including the Five Rivers Fisher School bridge on the Alsea River, Chitwood on Mary’s River, North Fork Yachats River and Drift Creek bridges, and many others that were flooded or removed. I call this man, the builder of Ritner Creek bridge on Kings Valley Highway ‘Uncle Ote’ because that is what my mother called him, even though he was her grandfather’s brother. In addition to building the only covered bridge left in Polk County, Uncle Ote has another Polk County connection: His grandfather is Benjamin Franklin Owen, one of Polk County’s first settlers. B.F. Owen is my great-great-great grandfather. We are a close family and I still attend Owen and Hamar reunions most summers in Dallas. I live in Independence with my husband. Our children are grown. According to family lore and written history, Uncle Ote was the builder-contractor or occasionally a partner in construction on dozens of Oregon bridges during his lifetime, 1887-1962, including many Howe Truss structures like Ritner Creek’s. Some of the others he built include Five Rivers Fisher School bridge on the Alsea River, Chitwood on Mary’s River, North Fork Yachats River and Drift Creek bridges still standing, and many others washed away or removed. “Uncle Ote” was partners in a company called Hamar & Curry, often misspelled Hamer, probably by the State Highway Department who hired them to build Ritner Creek bridge. He was born Hamar, his children spell their names Hamar and if possible, his family would like to see this spelling corrected, although they are more concerned with keeping the bridge intact. I am here to volunteer our families to help however we can in the county’s effort to maintain that bridge. According to Historic Highway Bridges of Oregon, the Ritner Creek Bridge was built in 1927 on the Kings Valley Highway. In 1976, Polk County voters approved a one-time levy to pay to move and repair the bridge. School children collected pennies to help in the effort. The state turned our bridge over to the county at that time (161). By the time the Ritner Creek Bridge was built, there were about 450 covered bridges in Oregon. By the time it was moved 50 years later, just 56 remained. Due to concern for these losses, the State Historic Preservation Office nominated the remaining covered bridges to the National Register, but not all of them made the register. Ritner Creek Bridge is on the register (163). Smith, Dwight A, James B. Norman, Pieter T. Dykman. Historic Highway Bridges of Oregon. Salem, Oregon: Oregon Department of Transportation, 1985. Hamar, Lois. Salem, Oregon. Living niece of Charles Otis Hamar Jr.
Gentemann, Lee. Salem Oregon. Hamar family member and genealogist, see: www.gentemann.com. The Friends of Ritner Creek Bridge is a federal non-profit organization. All funds sent to the Friends are used to maintain the bridge. Donate by mailing checks to Friends of Ritner Creek Bridge, 593 E Street, Independence, Oregon 97351. An electronic and mail receipt for tax purposes will follow.